Ferrari had a quiet morning on Kimi Raikkonen’s final day in the car, and it finally managed to carry out some race simulation work with the Finn in the final two hours of the day. That left just enough time for some short runs just before the end, which enabled the 2007 world champion to set the third-fastest time. 12:30 As the recovery truck heads back to the paddock, we have a little over two hours to go here. If we have any more disruptions that could prove costly to Raikkonen’s hopes of getting a race simulation in. 13:03 That first stint from Raikkonen was three laps longer than Alonso’s opener yesterday afternoon, and on average it was around 0.3s per lap slower than the Spaniard managed. 13:36 Raikkonen pits for a second time in this race simulation. Ferrari are running this ‘race’ slightly differently to Alonso’s yesterday, giving Raikkonen a much longer second stint than his team-mate did. Edd Straw (@autosport on Kimi’s bad luck in testing): “Sometimes things just go that way. With only 12 days of testing, usually one driver will be the unfortunate one. For example, prior to today, with one day left for each, Nico Rosberg was about 500km up the road from Lewis Hamilton. “Certainly, Raikkonen has been extremely unfortunate – and has had problems again today – but he’s a professional, experienced driver and it won’t disadvantage him. As he would doubtless say, he knows what he’s doing! The sun was still shining on Scuderia Ferrari as it tackled the penultimate day of testing at the Sakhir Circuit. It marked Kimi Raikkonen’s final test appearance prior to the Finn getting back behind the wheel of the F14 T at the Australian GP in twelve days’ time. In the morning, after a series of laps, the team had to deal with a problem relating to a connector, which meant the mechanics had to partially dismantle the car to get it fully sorted out. 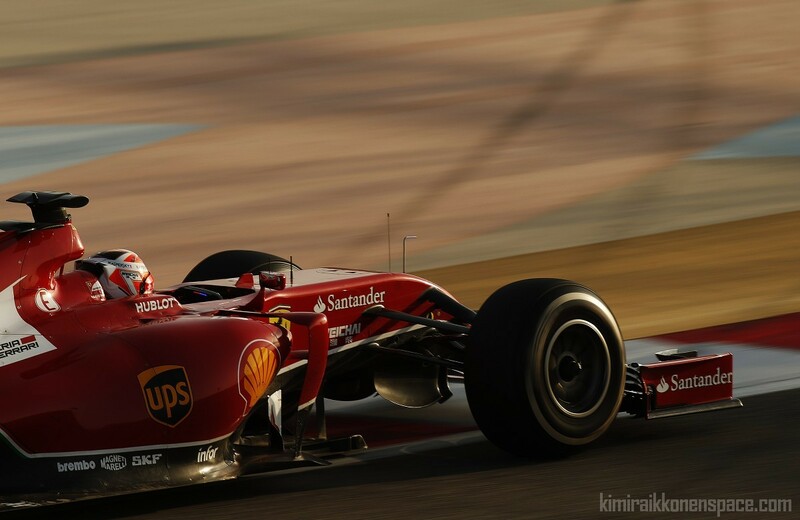 In the afternoon, Kimi did some short runs as well as a race simulation, including some live practice pit stops. Testing continues at this circuit tomorrow, when Fernando Alonso will be on track for the final day of the test.